CareFor™ ULTRA Odor-Control Underpads eliminate the unpleasant, embarrassing urine odors that result from incontinence. Powered by Halo Shield ®. Kills 99.9% of odor-causing bacteria. 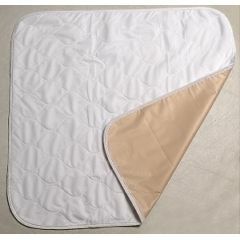 AllegroMedical.com presents The CareFor ULTRA Odor-Control Underpad. CareFor™ ULTRA Odor-Control Underpads eliminate the unpleasant, embarrassing urine odors that result from incontinence. Powered by Halo Shield ®. Kills 99. 9% of odor-causing bacteria. 100% waterproof protection for bedding and chairs. Ultrasoft moisture-wicking top layer. Super absorbent inner layer quickly traps fluids. Non-irritating for sensitive skin.